Our family attended St. Francis Church, the supportive faith community which assisted with PCL’s beginnings. My friend/client Eleanor Horrigan, a former board member of PCL, would chat me up about PCL and I would contribute gift certificates for fundraisers. 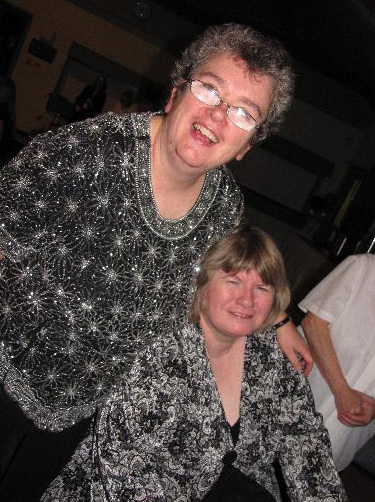 Through Eleanor, my sister Paula would receive news about Kathy, a resident of Westvale and former high school buddy of Paula’s. I tried many times to get Paula and Kathy together, but Paula’s work schedule (a work week with 12 hour shifts) made this impossible. I had many sleepless nights worrying that Paula had no friends that she could really relate to. My worries were never far away – how would she cope without Mom with whom she lived or me? Paula’s first exposure to PCL was at the Friday night club. I tear up as I type as I remember Paula and Kathy K. meeting for the first time in years… hugs and high fives were the order of the night. I watched with great satisfaction as their heads bobbed in conversation. By the end of the night, Paula had four new friends. My heart was full. I knew that I needed more information and help… So many acronyms: DSAC, PCL, SSAH, ODSP! The PCL Parents and Members Committee saved me. Overnight I felt that my extended family had grown. The members understood my worries. I really didn’t need to explain. I know how clichÃ© this sounds – but the weight of the world slowly lifted for me. Feeling supported makes such a difference. PCL offered Paula a day program at the Westvale house. Every Friday for two years Paula enjoyed the company of the gals at Westvale House, doing craft projects and sharing stories. I have watched Paula grow so much, thanks to the help of PCL staff. They have been able to effect changes that family can’t always facilitate. Paula’s transition from home to the Casey house was smooth and seamless thanks to the Westvale experience. Paula saw what a rich and supported life her new friends enjoyed and hoped to find such a place herself. The Radford family feels blessed to have found PCL and very honoured to be a part of such a stellar organization. I now get to visit my sister Paula and her extended friends and family… very cool indeed! Paula is proud of and happy with, her new life. We now all have a new level of peace of mind!! Submitted by Teresa Butler (Radford), September, 2010.